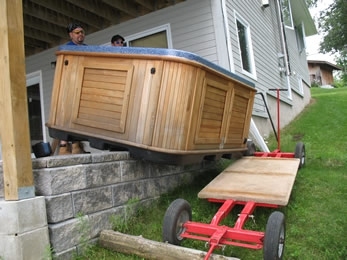 Moving a hot tub is a process that can be dangerous if you are not equipped with the right tools and equipment. In addition to the helping hands of a few friends, you should also come prepared with an appliance dolly, two four-wheeled furniture dollies, tow straps and 4x4 lumber. The furniture dollies will come in hand for flat-ground transportation, and the appliance dolly for ramps, hills and stairs. The first thing that you are going to want to do is unplug the spa completely from electrical currents, gas lines and any other connections and hookups. Wrap all of the cords up into the wooden enclosure so that there are no dangling cords that can get in the way. Make sure that the motor is properly secured in its place. Also make sure that the hot tub is completely drained and dry, and that the drain cap is securely tightened in its place. Now turn the hot tub over onto its side with the help of friends, which will make the moving process significantly easier. Now you should make sure that you have given yourself enough room to place people on each side of the hot tub turned over on its end. Everyone should lift the first corner, placing a 4x4 sheet of lumber under the lifted corner. Do the same thing to the other side, making sure that everyone is capable of lifting the hot tub up at this point. The two furniture dollies should be used to move the hot tub when traveling along flat surfaces. For upstairs and downstairs moving, you are going to want to use an appliance dolly with tow straps attached. With the hot tub on its side, place one of the two dollies under the back side and place the other dolly under the front side of the spa. Most of the dollies you can rent will come with straps attached. If you do not have straps, make sure to rent some as they come quite in handy for this purpose. The straps should be made secure so that the hot tub is not capable of falling away during the transportation. Once you are ready to move the hot tub back to the ground, remove the dollies one by one and have the hot tub be lowered slowly to the ground. This needs to be done especially slowly because the hot tub can crack or shatter if it is set down too hard. Make sure that the hot tub is brought carefully down to the ground, grabbing the sides and the corners carefully. Keeping a 4x4 piece of lumber under each of the corners will make it easier for you to rest the hot tub on its bottom without it sustaining damage. To remove the 4x4 slats of lumber, lift each corner of the spa one at a time and have someone else slide the wood sheets away.